Ok, so obviously the current election is my muse for this post. 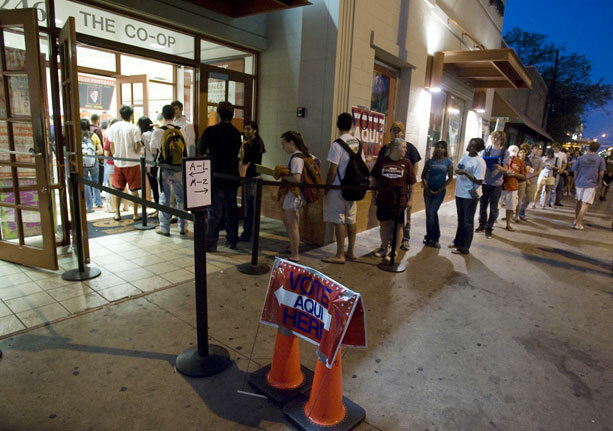 The record-setting turnout for this election here in Austin, particularly among the 18-24 age set, is very exciting. It is also one of the things I LOVE about Austin – we’ve got spirit, people! We get excited about what’s going on, whether it be a football game or presidential election. I love the sense of enthusiam around the city during major events, and even more the fact that the people of Austin get so into it. I know there are many watch parties around the city at bars, restaurants and people’s homes. Have fun, everyone! KVUE has projected Travis County’s voter turnout to be 80%!! Way to go, Austinites!! This is a great point, Brittany. I came from a high school where pep rallies were mistaken for dirges. It took a little getting used to, but I’ve completely fallen into line. Of course not everyone is all about football or politics or really tolerant of that excitement either, but on the whole, it’s pretty cool to live in a city with such energy. I wonder how Austin compares to other young cities… anyone? Jeff, you should have gone to high school in Texas – we are quite spirited around here! I dunno, Brittany. I went to middle and high school in Texas, and pep rallies always kinda creeped me out. I mean, take off an hour of class so we can all yell about how great our high school is before a football game? Weird.